Rachel Brosnahan is incandescent in this stand-up series from Amy Sherman-Palladino. Maybe they just put those ads in newspapers to distract us, because if women don’t realize what’s going on in the world, they won’t step in and fix it. Because they will fix it! And accessorize it! It opens at a wedding, with a young woman at a microphone, in a bridal dress. And she is killing it. The new Mrs. Maisel (neé Weissman) is bright-eyed and charismatic, naturally witty in the way that only an Amy Sherman-Palladino heroine can be, with half-sentences pouring out a mile a minute. She closes her “set” by sunnily announcing to her predominately Jewish audience that there is shrimp in the egg rolls, and basks in the consternation that follows. Title card, in curly retro pink: The Marvelous Mrs. Maisel. The new series from the Gilmore Girls and Bunheads creator, which dropped on Amazon Prime on November 29th (after the pilot was made available back in March), is eight hours of pure pleasure — and all the more delightful for how little I knew about it going in. In 1958, Midge is a simple (if brazenly self-assured) housewife on the Upper West Side, supporting her husband Joel (Michael Zegan) as he pursues his dream of becoming a stand-up comic. But you don’t have to watch the pair for more than five minutes to know that it’s Midge with the gift; the puppy-faced Joel can’t get through a set without ripping off Bob Newhart or someone else, while Midge scribbles joke ideas away in her notebook. Nevertheless, they seem to have an idyllic marriage and young family, with her parents (Tony Shaloub and Marin Hinkle) living just a few floors down. But by the end of the pilot, all of that has been turned upside down: after bombing yet again at local haunt the Gaslight, Joel confesses that he’s been having an affair with his dimwitted secretary, packs up his things in Midge’s suitcase, and leaves. Later that night, a drunken Midge stumbles back to the Gaslight and, during a lull between acts, launches into a hysterically crass monologue that concludes with this straight-laced Bryn Mawr graduate being tossed into jail for indecent exposure. But out of the ashes of this dramatic flameout, a future comedy star is born. None of this, or anything that follows, works without the right actress in the center, and Rachel Brosnahan is to Mrs. Maisel what Rami Malek is to Mr. Robot: indispensable. Brosnahan has come a long way since “Call Girl” on Netflix’s House of Cards, where she was so good with a nothing character the writers eventually gave her a name, then dramatically killed her off. She was even better on the short-lived, beloved-only-by-me WWII drama Manhattan. But she’s never had a chance to shine in a role like this, on center stage, showing off her comedic chops — few ever do, and that’s part of the brilliance of Mrs. Maisel. We get to watch a woman find her voice on screen while in real life we’re in a watershed moment for female-driven stories, and whatever can be said about Amazon, they’ve spared no expense on this one. Just on a technical level, Mrs. Maisel is immaculate. Its recreation of 1950s Manhattan is pretty stunning, and it’s not all just set work, either. Sherman-Palladino — who directs five of the eight episodes — is constantly gliding, gliding, pushing her performers to quickly deliver mouthfuls of bon mots in multiple long takes per episode. Her work has always had an element of screwball, but the period setting, fabulous dresses, and pitch-perfect soundtrack (mostly Broadway!) help make this the most fully-realized production she and her husband have ever put their names on. And it’s more than just fun (oh, is it fun): it’s warm, and meaningful, and full of empathy for nearly every character on screen. Midge’s accidental early foray into the comedy scene first connects her with the already legendary Lenny Bruce (Luke Kirby), who so appreciates her fearlessness that he bails her out of jail, though he warns her that comedy is a job that “should not exist — like cancer, and God.” The blue-collar manager of the Gaslight, Susie Meyerson (Alex Borstein, terrific), sees Midge’s true potential, and takes the young woman on as a client despite Susie never having been a manager before. 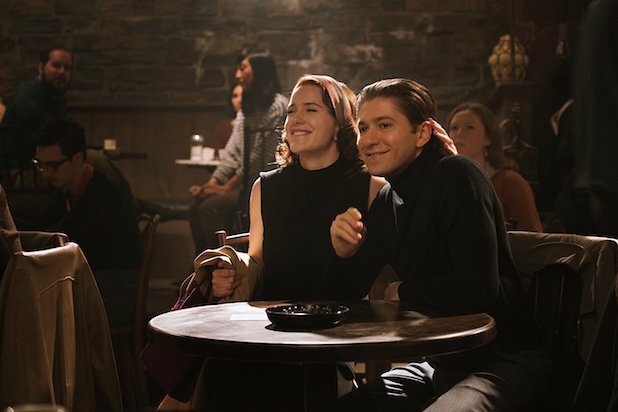 It’s their partnership — “You’re like a super-coiffed science experiment” — that forms the beating heart of Mrs. Maisel; both strong-willed women, unlike in every other way, even whether to believe that Midge has what it takes (or if this is even a good idea). Research outings and early gigs make for a demanding schedule, and Midge has to go to great lengths to hide her moonlighting from her increasingly-worried parents. Tony Shaloub is consistently great as her father, Abe, a math professor who holds some of Midge’s secrets safe despite his better judgement. Major credit also goes to casting director Cindy Tolan, who fills even the smallest roles with overqualified performers with an ear for this kind of dialogue: Kevin Pollack as Midge’s wealthy father-in-law, Moishe Maisel, who won’t shut up about the “THIR-teen Jews” he rescued from Germany (this is an extremely Jewish show, and some of the best jokes depend on your knowledge of the culture); Nate Corddry as a gentleman who becomes Midge’s improv partner at parties; Wallace Shawn as a joke writer; Jane Lynch as a “bag lady” comedienne in the style of Phyllis Diller, where the sleekly-dressed Midge is more of a Joan Rivers. The only weak link, so to speak, is Michael Zegan’s Joel Maisel, who refuses to leave the narrative despite the story being much more interesting without him. Zegan is good, but Joel is such a schmuck it’s hard to engage with his work-related C-plots when we could be watching Midge discover what kind of comic she wants to be, and every successive scene only breeds resentment. Nevertheless, The Marvelous Mrs. Maisel lives up to its title. Midge is drawn to comedy despite her upbringing, lifestyle, and society’s conventions because it’s the only thing in her life that brings her joy. She needs it, even though she tells herself otherwise; even when she dies on stage, she lives. And — most importantly — she’s really, really, good. Sherman-Palladino’s rhythmic dialogue and fluid directorial style is the perfect vehicle for Brosnahan’s effervescent charm, an ideal melding of material and performer that keeps you binging even when the plotting stalls for an episode. We’ve seen so many television characters that are supposed to be funny, not be (Studio 60, anyone?). Mrs. Maisel, and Mrs. Maisel, is lightning in a kosher wine bottle.